We are quite crazy about salt dough crafting in our house at the moment. Last week i posted our favorite recipe and some directions for models that are fun to do for kids from age 2 (click here for the link to the post). 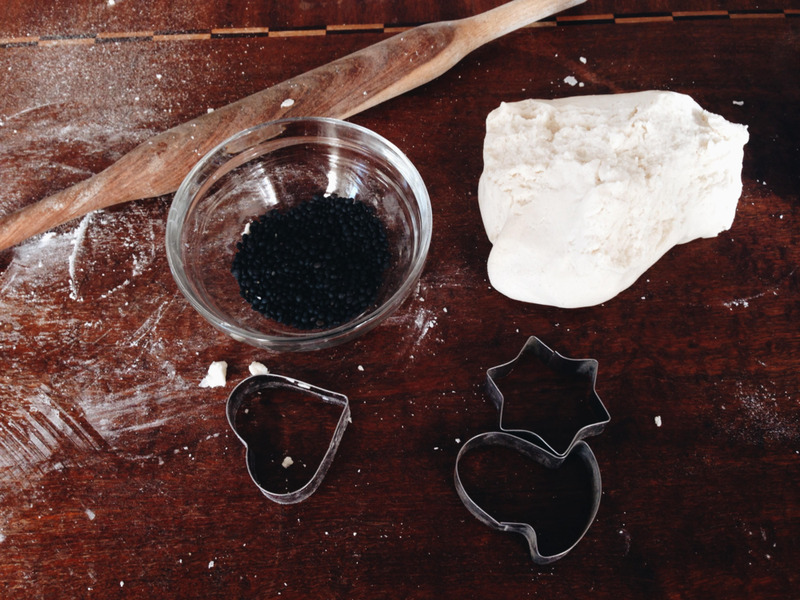 This week, i am sharing some ideas about salt dough stuff to do with bigger kids. There seems to be a trend around lately for beautiful moon phases mobiles, moon drawings ect. So here is an idea about how to create a hanging wall decoration with moon phases out of salt dough. Take a chunk of salt dough and roll it into a ball, flatten it with the palm of your hand and level it to about 1 cm height with the help of a rolling pin. Then cut out one big round piece with the bowl and 7 smaller round pieces with the cookie cutter. Put all of the pieces on a baking tray layered with baking paper. Put the biggest piece in front of you and imagine that you are looking at a clock. Take the chopstick and make holes at about 1 cm from the edge of the circle at the following "hours": one at 12 o clock, one at 3, 4, 5, 6, 7, 8 and one at 9. Then make a single hole at 12 o clock in all the smaller pieces. Follow the instructions for drying and baking the salt dough in creative afternoon #4. Once the pieces are dried, baked and cooled down, you can paint all of them with the black paint. Don't worry if they are not flat and look a bit bumpy. This will make your moons look more like moons actually...Once the black paint is dry, paint some white dots of different sizes on the biggest piece. This will be a dark sky with stars. For the smaller pieces, draw a moon phase on each one of them. You can either improvise, like i did or you can look for moon phases in the internet and recreate their shape. For the smaller ornaments, you can add a few small white dots of different sizes to make stars on the small surface that stays black next to the moon (like in the pics below). Once everything is dry, put all the pieces on the table and place them in the way that you would like your wall decoration to look like when finished. Take the piece of white toilet paper and tear it to 7 little pieces. It might seem weird to you that i use toilet paper for crafting but it is actually a great material, since it kind of dissolves when mixed with liquids and gives a paper paste that is quite uniform. Wash your hands very well and make sure that they are free of paint. Pour a little bit of white glue on the first piece of paper and roll it in the palm of your hand to form a little ball. Once done, wash your hands and repeat the process, till you have 7 small balls. Don't worry if they are not all the same size. Wash your hands before starting a new ball, to avoid that the balls get dirty with dried up glue. Then cut 7 pieces of yarn (they should all be about 5-7cm longer than the distance from the smaller "moon" pieces to the bigger "space and stars" piece. Make a small knot at the end of the yarn and move each yarn piece through one of the small balls. Then pass the yarn through one of the holes of the "space and stars" piece, so that the small white ball will be in the front of the piece. Repeat the process 6 more times. When finished, attach the small "moon" pieces to the yarn in the height that you want (make sure to thread the yarn from back to front of the smaller ornaments and tie the yarn with a double knot. Cut the remaining string. Repeat the process 6 times. When the paper balls are completely dry, you can paint some of them with a bit of black paint, like i did in the pic below, to make them disappear. This will make the stars in your "space and stars" piece more random. Cut one last piece of yarn for hanging the wall decoration, tie it at the top of the "space and stars" piece, put your finished work up on the wall and enjoy. Most of my joy and wish for crafting comes from my mother and the many many projects she did with us. Specially for birthdays of family members, she always had ideas about nice presents to create with us. So it was quite natural that when the birthdays of all of Alva's grand-parents came up (they were all born within the same two month) i searched for small projects i could do with him. It's not quite easy to find something suitable for a toddler to create and enjoyable/useful for a parent to receive...Alva loves to scribble around with paint and brushes. The result of it is often a baby covered in colors and a white paper, but he enjoys it so much that i let him. So i thought to work with his joy of scribbling. - A wooden box or any other wooden object that you think fit (mirror with wooden frame or picture frame, pin-board, terracotta plant pot, ect...) - I got a simple box with a small locker at a craft store. 1. Cover the table you are working on with some kind of protective layer. 2. Paint the box in the color of your liking. Let it dry for several hours and make sure that the paint is entirely dry before you go to the next step. If your kid is old enough, maybe he/she can do this step on their own with your help. (You could of course also skip this step and let your kid paint on the natural wood). 3. Let the fun part begin. Put some clothes on your toddler that you don't mind getting dirty, (or take all the clothes off him/her)... Show how to dip the brush in the paint and make a first stroke on the box, then hand off the brush to your kid and let them do whatever they choose to do. eventually turn the box slightly to make them paint on all surfaces more or less equally. 4. Since the painting of the box is probably done pretty quickly, get a piece of paper ready so your kid can continue to paint without getting frustrated. In the meanwhile, put the box away to a safe place to dry over night. 5. Once dry eventually apply the layer of lacquer. This should be done by YOU and never by your kid!!! 6. Finished is the birthday present...Maybe you can even use a piece of the extra paper you gave your kid to paint on as a matching birthday card. One of the things i like most about weekends - besides family time and baking, is crafting. At the moment, Alva is fascinated by elephants. Every object in the house which even remotely resembles an elephant, is an elephant in Alva's eyes. So i decided to print an elephant shirt for him. I wanted to keep it as simple as possible. One color on an unicolor cotton shirt. Here is the very simple step by step DIY tutorial. At the end you will find the print out templates for 3 different animal shirts. The elephant, a giraffe and a whale...Please notice that this tutorial is not suitable for kids under the age of 10. For smaller kiddos, i recommend to cut out and glue the shape yourself and let them apply the color with your assistance. 1. Once you have the template printed out in the right size to fit the shirt, start cutting out the elephant. Make sure to keep the "ear" and "eye" cut outs, you will need them later. Place the carton piece inside the t-shirt, to make sure the paint will not pass on the other side. 2. Flip around the paper and apply a layer of glue to the borders of the elephant. There is no need to apply glue on the rest of the paper. It would just make it unnecessary difficult to remove the paper afterwards but make sure that all the edges, specially the smaller parts (like the tail) are covered. Flip the ear and eye as well and apply glue to them. 3. Flip the paper and press it on the shirt. Place the ear and the eye in the correct place. Make sure that all the small parts are sticking well to the fabric in order to guarantee a clean edge for your drawing. 5. Till it looks like this...then let it dry for a few hours. 6. When the paint is dry, gently remove the paper. This can be a bit tricky, since in some small parts, thin layers of paper will probably stay. Don't worry too much about them, since the glue is washable, they will come off later once you wash the shirt. 7. Follow the instructions on the textile paint about how to fix it permanently to the shirt. For Marabu colors, you need to place a cloth on the drawing (to prevent ruining both your iron and the drawing) and iron the painted area for 3 minutes (cotton heat without steam). 8. Wash the shirt with 30 degrees celsius to take off eventual remaining bits of paper and glue. I wanted to create something nice for the white wall space in Alva’s room. The main criteria were budget and educational. I have been reading about Montesory education lately and I like their approach of learning through ordering and classifying objects, so I wanted to go in this direction with my project. Alva’s room has a lot of natural elements and I decided it should be something with shells. A few years ago I saw some really nice art pieces made with shells by Peter Greenaway. I took it as my inspiration, collected some shells on one of our beach walks, ordered them by sizes and from darker to lighter color and glued them on a painted wood board. I love the result. We hung it in the kitchen for a while to look at it. You could make this picture with any objects that you find nice. (Please make sure that small objects don’t come off if you have small children that tend to put everything in their mouth). 1. Take a piece of wood (I found mine in our backyard), sandpaper it a little and cut it to be 38x29 cm. 5. Paint the whole surface with diluted white acrylic paint. The wood structure should still be visible. It’s best to make a few tests on an other small piece of wood to check the water/color balance and that you like the result before starting to paint on your board. 7. Measure were to put your shells. Just do a little mark on the spots, don’t mark the dotted lines. The spots will give you the place where to center each of the shells. 8. Glue the shells on the board (I used a hot glue pistol). Fix a picture hanger on the backside.